Chiappa Firearms' expertise in precision CNC manufacturing produces a perfect solid frame and valve housing in aircraft aluminum. 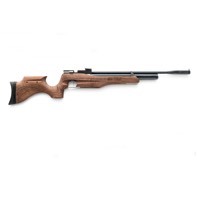 Thanks to the side lever cocking system this rifle is easy to load for all marksman. Constant speed is guaranteed by the tuned adjustment of the pressure reducer. Approx. 550fps / (167 m/s) Ave.
Approx. 800fps / (244 m/s) Ave.
Approx. 820fps / (250 m/s) Ave.
Approx. 860fps / (262 m/s) Ave.